Deus Ex: Human Revolution is already getting great reviews, though it doesn't release until tomorrow. And now a Deus Ex clothing line has been announced for what promises to be a blockbuster game. The clothes, created by online fashion retailer Musterbrand, are what we've all decided can only be described as "pretty snazzy looking". We've got a sneak peek at a variety shirts, pants, and Adam Jensen's trenchcoat. The nice thing about all the clothing, including the trenchcoat, is that they're clothes you can wear on a regular basis, not just once a year at a con. In fact, what we've seen of the line is on the classier side of nerd-pride, as the logos on the shirts are subtle, while still making direct reference to the world of Deus Ex. To those unfamiliar with the game, you'll look like a regular, nicely dressed dude or lady. For those in the know, you'll be making hard-to-catch references to various companies that can be found throughout the game. 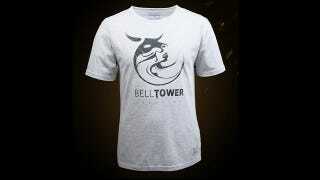 Our own Kirk Hamilton has gotten a chance to play the game, and was pleasantly surprised by one of the choices made for the clothing line: "Rather than Adam's employer Serif Industries, they went with the Chinese private security force Bell Tower. That's actually sort of cool, since it's a more obscure reference, and a rad company name to boot." In a piece that Kirk and Kotaku guest writer Leigh Alexander wrote, leading up to the release of Human Revolution, Leigh points out that everyone in Deus Ex seems to be sporting a trenchcoat. Once this clothing line launches, you can too. And everyone will think you're snazzy.